While we wrote the suggestions for iris culture mainly for our customers who live in the eastern zones, they can be applied to any zone with some alterations. The best way to find out what works in your area is to join a local iris society and your fellow members will help you to grow your irises to their best possible potential. In our zone 6 garden we mulch our irises in the fall to prevent frost heaving. We use about a one inch cover of shredded pine mulch and we find that it not only prevents frost heaving but the irises grow better and we do not have soft rot problems in our raised beds. You can apply a preemergent such as Snapshot or Preen before putting down the mulch to prevent weeds. Irises are among the easiest of perennials to grow. These suggestions are to help you obtain the very best performance in vigorous, healthy growth and maximum bloom stalk production. Irises will grow to take up the space you give them and reward your efforts with unrivaled beauty. Spring only bloomers and rebloomers are best grown in separate beds as rebloomers require more water and fertilizer in early and mid summer to rebloom in late summer and fall. You can grow rebloomers with spring only bloomers if you group and mark the rebloomers in some way since spring only bloomers may rot with the extra watering and fertilizer in the summer. Never water your irises during the day as that can cause rot. Rebloomers take a little more care than the spring only bloomers, but they are definitely worth the extra effort. Rebloomers need more water and fertilizer since they need to grow large rhizomes in order to send up additional stalks in late summer and fall. We fertilize all of our iris beds in the early spring (late February to early March) and again after spring bloom with a fertilizer mixture high in phosphate with slow release nitrogen. We use Pennington® lawn starter with 18-24-6 mixture that has trace elements added. We sprinkle the granules of fertilizer sparingly on the ground around the root zone area and not directly on the iris clumps. Owings and Doris Rebert (our Region 4 members who have a lovely garden in Maryland in zone 6-7) obtained excellent iris growth and bloom stalk production for over 50 years in the same established beds without resetting by using inexpensive 10-10-10 (N-P-K) fertilizer mixed one to one with superphosphate (0-45-0) giving a 5-27-5 mixture. Apply a handful of this mixture around each iris clump in early spring as the foliage first begins to grow. Apparently, it is the extra phosphate that stimulates abundant bloom stalk formation. However, to photosynthesize for growth and increase iris plants need a ratio of 16 nitrogen atoms to 1 phosphorus atom, so nitrogen can be limiting. After our bloom season in June, we treat all of our iris beds with liquid foliar fertilizer, such as Peters ® or Miracle Gro ®. (Be careful when using a hose dispenser not to over apply the foliar fertilizer.) For beds with rebloomers, we repeat this foliar fertilizer in late summer and early fall and keep them watered if needed so they do not go dormant. Heavy (2 inch deep) shredded pine or oak bark mulching of the sides of the raised rebloomer beds and light (1/3 inch-1 inch deep) top mulching will help to retain moisture. Before the first hard freeze you may want to cut and bring indoors the flower stalks with well developed buds to enjoy their bloom. Since most rebloomers increase faster than spring only bloomers, you may need to separate and replant them every second or third year. Some cultivars need to be well established before they rebloom, and these you should divide and reset only half of the clump and leave the rest to rebloom. If you are removing stalks and rhizomes to share or for sale, your soil needs to be replenished with nutrients. Irises, and especially rebloomers, are heavy feeders and when they are divided and replanted preparation of the soil should be top priority. Also, the aerated structure of the soil needs to be reestablished. Even without stepping in the iris bed, the soil can settle and become compacted. We have developed the following procedure that allows us to effectively reset the iris plants and restore the soil. Dig the clump deeply with a fork to save as much roots as possible and break up the whole clump. It is not necessary to cut back the fans at this time, just remove loose leaves. Irises grow best in beds raised 4-8 inches and thrive with a 12-16 inches of cultivated depth for root growth. Dig the top four inches of soil and place in a wheelbarrow or large pan. Dig down eight inches more and turn over the soil with fork, shovel, or small tiller. Prepare the sand, nutrients, and organic amendments as follows: Nearly fill a wheelbarrow with one part soil that has not grown irises, one part concrete sand, and then one part organic material such as well aged garden compost, composted cow or chicken manure, and/or leaf mold and mix thoroughly. To this mixture we add one cup of each of the following: rock phosphate, green sand, granular dolomite (for calcium and magnesium), wood ashes (excellent source of trace elements), and a good balanced nutrient mixture of slow release nitrogen, phosphorus, and potassium plus boron, zinc, iron, copper, molybdenum, and manganese (such as Pennington lawn starter 18-24-6 or Nursery Special 12-6-6 by Sta-Green ®). (Others strongly recommend adding alfalfa pellets or meal as an organic amendment that has the growth stimulant Triacontanol.) These nutrients are mixed in a pan and then mixed in the wheelbarrow with the soil, sand, and organics. This soil/sand/organics/nutrients mixture is then added about 1:2 to the eight inches of soil you have dug and thoroughly turned over with shovel or small tiller. Add back on top your relatively nutrient poor topsoil and dig in the iris plants so their roots are straight down into the nutrient rich, mixed soil below. Point the toes of the plant inward in the new clump with the fan ends facing outward. Do not cover the top one fourth of the fan end of the rhizome with soil. We use and position all the old pieces of bare rhizomes among the rhizomes with roots and fans. The bare rhizomes are covered with ¼” of soil as they are excellent sources of the trace elements the rebloomers need, and many will live to sprout new increases with fans and roots. Press down the soil firmly so the wind won’t blow over the plants, trim back (optional) the tips of the leaves, and then give this 4-8 inch raised bed a good soaking. Raised beds at Winterberry Gardens mulched with shredded pine. 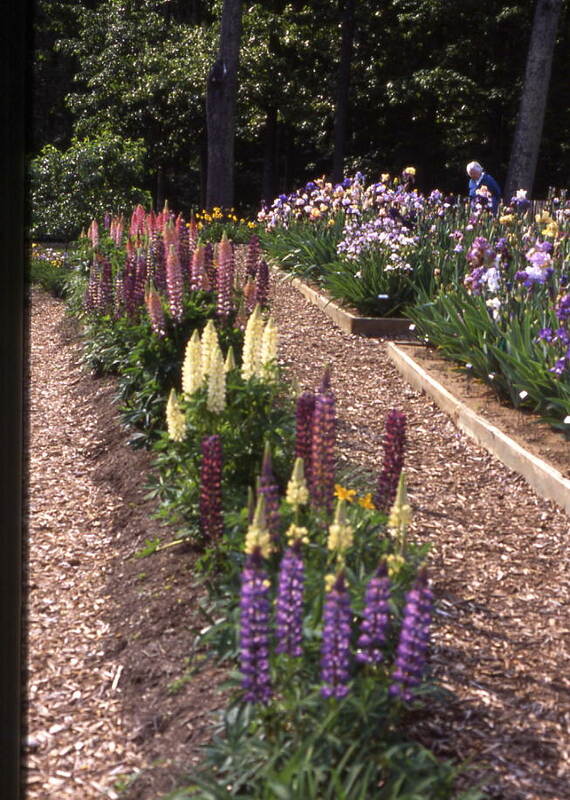 Lupines (in the foreground) grow here because of the cooler weather in zone 6 and they love the mulch. We control outbreaks of soft rot with a treatment of Dial ® antibacterial liquid hand soap with Triclosan diluted 1 part soap to 4 parts water. Also, the Dial® hand soap has a fragrance that seems to repel the flies that spread the soft rot plus sodium lauryl sulfate that helps return the soil pH to near neutral. A second follow up treatment usually stops the soft rot. You can use the hand soap undiluted to cover deeply infected rhizomes. (Others swear by the effectiveness of Comet © cleanser to control soft rot.) Acidic soil favors the soft rot bacteria. Powdered or granular lime (calcium carbonate) added to acidic soil is a good way to prevent soft rot as it buffers the soil to a neutral or slightly basic pH. In this sweet range (pH 6.7-7.3) the iris can best absorb nutrients from the soil. Also, soil high in clay favors soft rot. Ideal soil is called loam with equal parts of sand, silt, and clay plus about 10% organics. Irises planted in well-drained soil containing adequate sand and silt usually do not have soft rot; however, there are some cultivars that seem to have the problem when others do not, indicating that reduced doses of specific genetic factors are involved. Few reblooming cultivars are genetically susceptible to rot. Clean garden practices of removing dead iris leaves, old stalks, and other fallen leaves and debris in fall, winter, and early spring will reduce the presence of borer eggs and fungal spores as well as remove hiding places for slugs and cutworms. If you have a problem with leaf spot, treat with a fungicide with low toxicity. Periodically, you should change fungicides since fungi can become resistant. For bacterial leaf blight we cautiously use antibiotic Agristrep ©. If you have an outbreak of iris borers, cutworms, or aphids you can use a systemic insecticide with Imidacloprid such as Grub Control (brand names changes yearly) by Bayer which has a Caution, not a Warning on the label. Grub Control comes in easily scattered granules or a powder killing for up to six months only insects that feed on iris leaves and rhizomes, not beneficial insects. Use the granules or ¼ tsp. powder per gallon of water and treat twice, early in spring and a month later. We control slugs with Epsom Salts sprinkled lightly around the plants. Apply again after a rain. Voles and other burrowing rodents that eat irises can be controlled by setting out peanut butter baited mouse traps by their breathing holes under inverted pots weighed and darkened with a brick on top. Revenge © smoke bombs inserted into vole holes, ignited, and covered with dirt is an effective way to get rid of voles that eat certain iris cultivars. We strive to use environmentally friendly chemicals that can effectively and safely control iris pests. Signs and Labels: Quite a few of our customers have asked about how we make the signs for our irises. We buy our rust resistant metal markers from Eon Industries 107 W. Maple Street, P.O. Box 11, Liberty Center, OH 43532-0011 Phone (419) 533-4961 Fax (419) 533-6015. We like these because they have rounded edges so they don’t cut your arms while weeding. They are also a reasonable price. Since the prices may change from year to year you should call for pricing or ask for their brochure. We buy the 15 inch Nursery Markers. They also sell 10 inch and 20 inch and a variety of others. For the labels we either use our Brother P-touch ® laminated label maker, or for larger projects we use Avery® 5520 weatherproof address labels. You can purchase these from the Staples catalog center if they are not in the store. If you use the Avery® labels you must use a laser printer because an ink jet printed label may wash off. I use a database, either from Works or Excel, then select the fields to print, and I can make hundreds of labels this way. If using the P-touch, I use the 1 inch tape so that I can print out two lines, thus using both the name of the iris and the hybridizer and year of introduction. These labels have lasted for over 10 years with no signs of fading. If you put the marker on the legs of the label upside down and bend the top at a 45 degree angle, it won’t slide down in the winter from snow or ice.